My friends and I were fortunate enough to get the upper deck. Sadly we were not in business class whose seats were incredible. Now those are really wide seats. So here I was stuck in largest airplane in the world for the next 11 hours and here goes the experience. My mother had made it clear that she would never ride this plane in her entire life. I had always called it the flight from hell due to its large size. The upper deck is significantly quiet since it’s mostly business class and just 1/3 is dedicated to economy class. Gate A5 in Changi ariport was renovated to accommodate the A380. I thought that it would take forever to board but for real it didn’t. It doesn’t take much longer than a 747 to board the plane completely. Upon clearing the gate and into the tube, it split into three. The first is course for first class and the other two are for the main cabin and upper deck. It’s a slight incline to the get to the upper deck and you are welcomed into business class…which wasn’t our seat. Once we got to our seats, the first thing we noticed is that the upper luggage bins are small. In short, insufficient. I had admired Virgin America for it’s large overhead bins but these were small. It reminded me of that American Airlines 747 from Dallas to San Francisco. Luckily my stuff fit into the overhead and the seat in front of me. The seats are indeed more comfortable than any economy class I’ve seated in. The next thing I noticed was that I was sandwiched between two rows of children. Ouch. 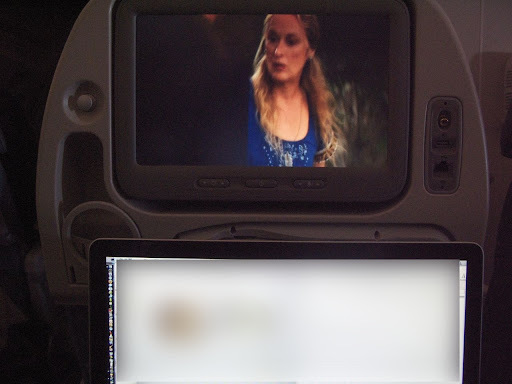 The screen is impressive even in economy. It’s a ten inch screen with a cup holder, USB port, ethernet jack, telephone, qwerty keyboard and coat hanger. The remote is conveniently located in front instead than the side which provides easy access and no accidental button pushing which is nice. 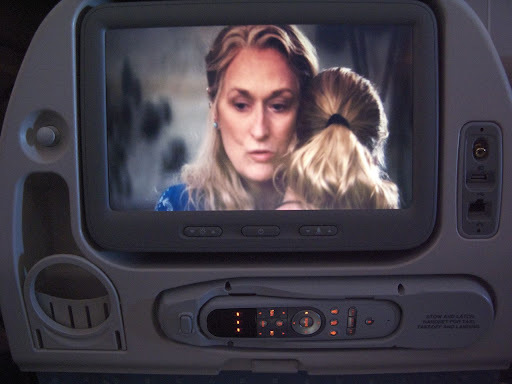 The inflight selection of movies and tv shows is the largest collection in any plane. With the usual latest releases and Hollywood hits, there’s also a wide selection of Chinese, Japanese, Korean, Indian and other Asian films. Each TV episode not only has one but two episodes each. 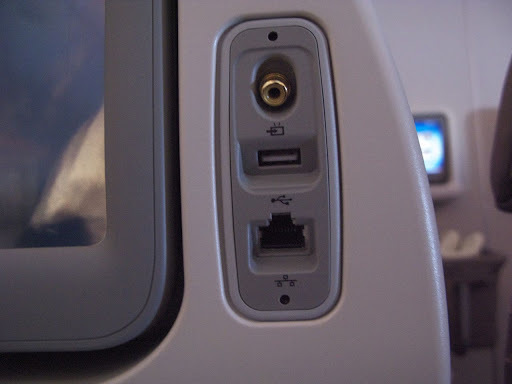 You can even plug in your USB thumb drive and access your files via a PC suite. I still have to try if my iPod works on this. The seat reclines to an acceptable amount. The tray table though is something else. The table splits into two since the entertainment system takes up quiet a lot of space. The initial fold reveals a slide mirror and another cup holder and the usual sliding tray action. However if you try to work on it. I wouldn’t recommend it. As I was typing this away while the plane was in motion. 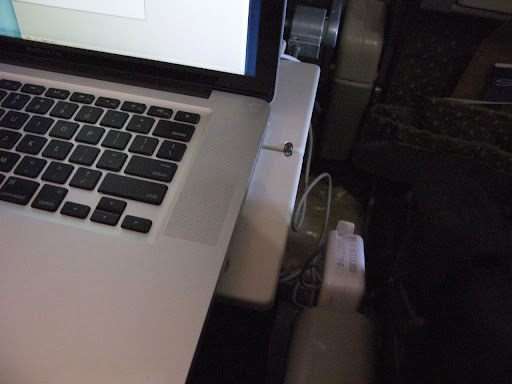 The Mac Book Pro is too big for the table and when the seat in front reclines, it becomes very difficult to work. The power in the seat isn’t always on. Only when my battery was about to shut down did the power kick in. It allowed me an hour of charge before shutting down again. The table is only meant for the netbooks and probably the air. But definitely not the mac book pro. Hint hint, I should travel in business class. My friend’s console kept rebooting it’s Red Hat Linux software and wouldn’t run so they transferred him to another seat. Which gave me and my other travelling companion a little more room to work with. The plane runs quiet. Although I’m not sure if it’s the same on the main deck. The wings are enormous. There are multiple flaps to provide the pilot with complete control over the plane. The service of Singapore Airlines is as always impressive and something to be modeled after. Their attentiveness and smile makes the trip bearable despite the kinks on the plane. Upon take off, the safety guide had to be done manually instead of the instructional video due to a glitch in the system. This is truly a feat of engineering but I had hoped for more space. In fact, I think the Singapre airlines version is already the “roomier” version of the aircraft. I just hoped that there would be something more to do on board. It’s already half way to London with another 6 hours to go. I’ll stand up and figure out something to do while on board. I’ll see if I can get a snack. Baggage handling was pretty quick or we were very lucky. Our luggage came right on the heels of the business class people so that was a very lucky thing for us. All in all this trip was very nice. I was able to sleep which is surprising. I usually don’t sleep on planes in economy class or when I’m travelling without my family. If I were given a choice to travel to London again. I would book it on this plane. Ever since Square-Enix announced a few months ago that a number of titles were heading to the 360, a lot of RPG fans felt betrayed (this seems to be the word of the day). So games like Infinite Undiscovery, The Last Remnant, Star Ocean and Final Fantasy XIII will see the light of day on the 360 giving a much needed RPG boost to the American console. But so far, it hasn’t been good to Square-Enix. Infinite Undiscovery just went from $59.99 to $19.99 in a matter of three months. Not a good sign if you are selling games. And now comes “The Last Remnant”. Initial release for the 360 and eventually on the PS3 and the reviews aren’t exactly good. In short, too many bad things to make this RPG even good. We’ll have to see what happens when Star Ocean comes out next year and FFXIII when it comes out. FFXIII has the distinction of being released first on the PS3 before being ported to the 360. This is one game that I will wait on the PS3 and hope that they will fix all the technical issues plaguing the game. How many Xboxes have you gone through? In the 3 years that the Xbox 360 has been around I have officially gone through four consoles, three of them defective. A friend of mine in the office has gone through two and soon to be three. The first one fell through the 3RL and E61 error, the 2nd one had those disk read errors, the third one had that perpetually “open tray” problem and now I’m on my fourth. And now, rumors of a “safe” xbox are coming out. I’ve heard that before. Like when I got the 3rd one. “This one is safe now.” I’ll never trust these claims again. This is just really sad, like really really sad. I’ve had my 1st generation PS2 since 2001 and it’s still running fine. Was Microsoft so desperate to topple Sony in the console wars that they released a console which was made from a lot of faulty parts? Unfortunately, it was Sony who shot themselves in foot and Nintendo is just kicking everyone’s asses. Sure the Xbox did good on this generation but at what cost? I feel betrayed. Like when you buy something that you know is supposed to be well made and built and spent a good amount of money on it and in the end it turns out to be a lemon. It’s much harder to get trust back. I was finally able to finish downloading the other areas and walk around a bit. There’s quite a number of other areas to explore such as the mall, bowling alley, movie theater and of course the central area. What I couldn’t figure out was that if Sony intended these to be default areas, then why not have included it in the original download in the first place. The areas can only be downloaded within Home and not through PSN. You can download the areas in background and still chat and walk around the area and interact with your surroundings but not much else. You can only dance so much alone in your house while waiting for the download to finish. I’m hoping that these could be downloaded in the background and you can quit Home and go play something else instead of just leaving it on, sucking up power (yes, the PS3 is technically the most power hungry console among the 3) play another game and then log back in once PSN tells you that the download has been completed. These aren’t the bugs yet, just the inconveniences. All the participants lack definition from afar. Meaning you won’t know who it is until you get pretty close. It’s very hard to notice if someone is trying to get your attention. Not to mention that everyone is wearing jeans and a t shirt doesn’t help telling people apart. It’s most probably my internet connection. But not everyone in the world has fiber running to their house at break neck speeds. Home needs a lot more background downloading. At this point it’s going to be another Second Life. It’s still very early but it holds a lot of promise. If this were to become the new interface for the Playstation, Sony is on to something and could be one step closer to creating a totally a very unique gaming experience. I would like the opportunity to launch games directly from Home. I would like to invite my friends on Home to play online with me in games such as Little Big Planet. I want my friends to visit my pad and see my stuff. I want all my gaming trophies on display for my friends to be jealous of. I want be able to buy stuff from the PSN store from Home and use in home. The possibilities are endless. Sony is really on to something here. It may be have been a slow start for Sony in this generation but it’s definitely not out yet. I’ll post the bugs when I see them and play a little longer. 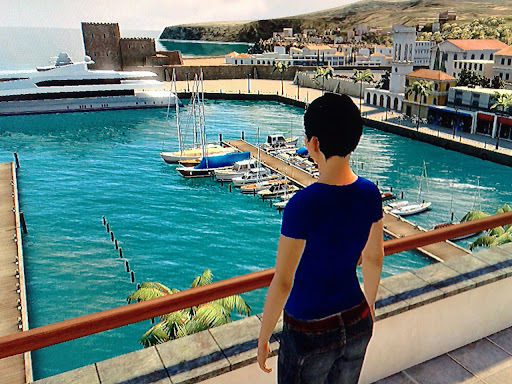 My camera phone does little justice to the images conjured up by the Playstation Home Beta. I was surprised to find my email inbox last weekend had an invite to participate. Much similar to the Little Big Planet beta, just enter the code in your PSN account management and the file will be added to your list of downloads. After downloading, I installed the program and asked me to log-in. I was pretty sure that it wasn’t my connection, but I couldn’t get past the EULA the whole weekend. I tried again today and I was finally able to get in, make my character and learn how to move around. Character creation is still limited. There is some slowdown when you get to configuring your hair since all of this information is still being downloaded into the console as you go along. Again, you’re waiting for things to load if your internet connection isn’t running that fast. It’s no Mii creator nor an avatar creator but it works more like Oblivion or Fallout 3. Shortly after figuring out how to communicated and navigate through playstation home, you will be asked to go to the Central area where the rest of the players are. But then it asked me to download the area which is approximately 35MB. So then I sat. Sat. Sat. Sat. Danced. Danced. Danced. Alone in my room with a view. I hate waiting. For a measely 35 MB it should’ve come with the initial download. I hate waiting especially when I was already awed by the graphics and the view and way to interact. In fact, all of the default external areas should be included in the initial download. I predict the stacks method of locations will prove to be a problem as more and more content gets developed for Home. Its linear method of navigation isn’t as intuitive as the way you will navigate through a map instead. Why not make it in Little Big Planet style? As of right now I’m still downloading my 35MB patch and will get to writing more about it when I get back from work. Mass mail SEGA for Shenmue! Fans have not given hope for Shenmue Part 3 in this MySpace page where action is demanded starting November 27, Thursday until December 29. They plan on sending toy capsules to the SEGA offices in Japan with “Shenmue” notes in them. If the Yakuza series on the PS2 isn’t your thing and still demand for the original, then click on the link and join the petition. Have you been hacked on your Xbox? Dan Hsu, former EGM editor in chief and now gaming journalist writes about his story on IGN where his account was hijacked. He continues on and gives tips on how to avoid getting hacked. It just makes me really sad. What can you actually do with that hijacked account except to create mayhem and make some player miserable.